Think about it: string trimmers and lawn tractors both cut grass. They just do it at different speeds. The same goes for two-stage snowblowers. 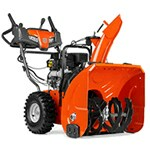 If the price isn't an issue, you simply buy the widest snowblower possible. 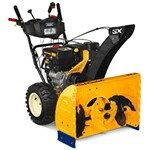 However, most of us aren't that fortunate: big snowblowers come with big engines and price tags. 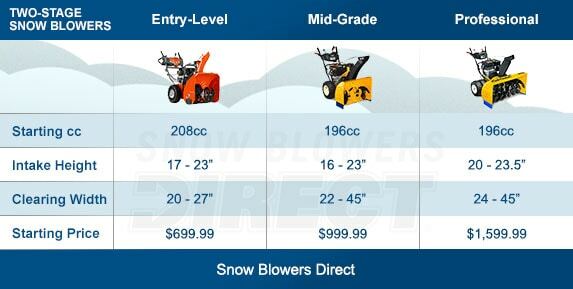 To find the best value, simply select your grade of snowblower first. If you just want to blow deep snow, you can’t go wrong with an entry-level, two-stage snowblower. They will always outperform any electric or single-stage unit. 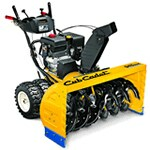 They can attack deep snow drifts – including the mountain at the end of your driveway – without breaking the bank. Think of them as an economy grade unit. They can tackle the task with just basic components and features. Mid-grade snowblowers are obviously bigger, beefier and stronger, throwing snow as much as 10 feet farther than their entry-level cousins. The majority of models come equipped with interlocking controls and halogen headlights, helping to light the way during the darkest days of winter. The other components aren't quite professional-grade, but definitely durable. 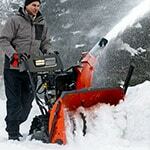 Most mid-grade snowblowers feature extra-strength aluminum – instead of cast-iron – gear cases and all-steel chutes. Get a mid-grade model, and you’ll definitely be the envy of the neighborhood. You won’t find professional-grade snowblowers rusting outside your local hardware store. These serious-duty snow throwers are built in limited quantities for snow removal veterans, who recognize quality doesn’t come cheap. Professional-grade snow throwers are constructed with commercial-quality components like heavy-duty cast-iron gear cases and solid steel frames. Basic features – like halogen headlights, interlocking controls, and remote deflectors – aren’t options. They’re necessities. It doesn’t get any better in terms of high-end performance and reliability. Unless, of course, you have a snow pro doing it for you! Track-drive snow blowers move like a tank across the snow; the tracks remain in constant contact with the ground on steep angles, giving it maximum traction. Unlike wheeled models, track-driven blowers are safe to use on steep paved or unpaved surfaces and are available on two or three-stage snow blowers. Most track-drive snow blowers won't allow you to turn the blower until a handle-mounted trigger is engaged for safe steering, and some models even have a variable speed control for easier operation. Two-Stage Snow Blower Buying Guide.. Our Power Equipment Direct how-to library can help you learn about Top-Rated & Best-Selling Three-Stage Snowblowers, Farmers Almanac Winter Weather Predictions and Proposition 65 Product Labeling.